On the morning of Dec. 28, 2014; 17-year-old transgender girl Leelah Alcorn walked onto Interstate 71, directly into oncoming traffic, and into the path of a semi truck, which killed her. Her suicide note, which she scheduled to go up later that morning, soon went viral. Chris Fortin a 33-year-old gay man who runs a small company from his home near Cincinnati took Leelah Alcorn’s story to heart. 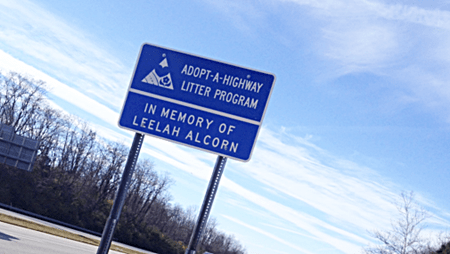 Shortly after her death, a small, handmade memorial to Leelah popped up along the highway on which she died. But it quickly started to fade away. That’s when Chris Fortin decided to make something permanent. Fortin then filed paperwork to adopt the stretch of highway where she died, a process that was free of charge as long as he committed to cleaning it. Croation Hockey Star Luka Novosel Poses Naked For Anti-Fur Campaign – "Real Bears Don’t Wear Fur"